Trading is considered a dirty word in the world of finance. Many books have been written about legendary investors, but very little is known about successful traders. What is it that makes traders successful? How is trading different from investing? What are the characteristics of a good trader? There are a few simple traits that a trader must cultivate, in order to be successful. But before we go into learning these traits, we must first understand a trader's mentality. A trader's motive is to make maximum returns with minimum risk, by looking at price movements. He seeks arbitrage across markets, while taking minimal risk. A trader doesn't go through the fundamentals of a company in detail as an investor does. A trader doesn't have the virtue of patience. He's only focused on "what's happening now, and how can I profit from it". 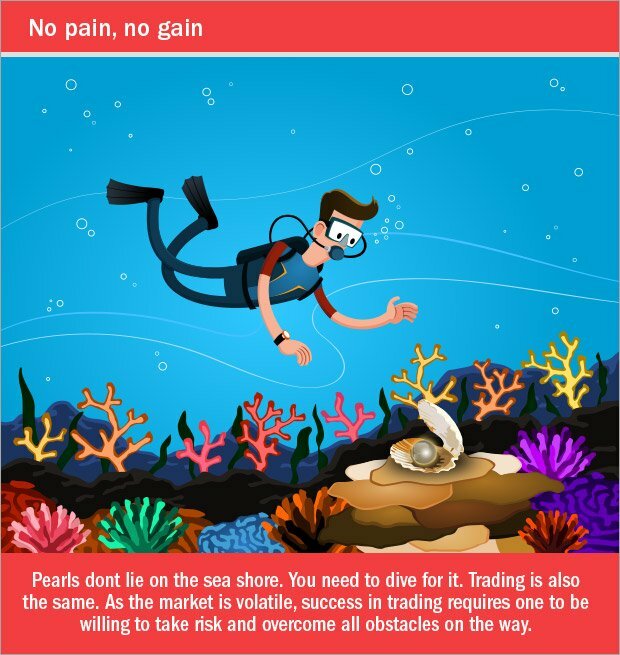 A trader's motive is to make maximum returns with minimum risk, by looking at price movements. He seeks arbitrage across markets, while taking minimal risk. Many people enter the activity of trading with money they can't afford to lose, and as a result, they start off trading with 'scared' money. Their fear of loss is greater than their desire for gain and so they trade with a nervous and anxious state of mind. Scared money never wins. Develop the habit of trading only with money that you can afford to lose financially and emotionally. Without exception, every trading author on the face of the earth says that cutting losses is one of the 'cardinal rules' of trading. But if you've ever traded, you know how your own mind can work against you when the time comes to sell at a loss. You'll start rationalising why you shouldn't sell- "it will come back'~ "it's just moving around", I'll sell when it comes back to the price I paid"-take your pick from the excuses. but none of them is the right way to think. The next thing you know, you've got the nightmare of a loss on your hands. Everyone experiences this in the Iearning stages. Successful traders identify their profit and loss parameters, before they enter a trade. They set their stops and stick to their parameters. They cut their losses and let the profits run their course ruthlessly. Instead of constantly looking out for new strategies and techniques, a successful trader consistently uses two or three profitable approaches, and nothing else. When executed with focus, even the simplest techniques will yield better results than if you're changing your approach every week. Find a system that works, and then work the system. The grass isn't greener on the other side of the fence. Learn your market, refine your personal approach to it, and stick with it. 4. The habit of back-testing new strategies before using them: Thousands of investors are following the market on a daily basis. As the existing strategies are used by more and more people, the probability of profiting from them reduces. This makes traders to keep searching for new strategies all the time. Due to this, lot of people come up with novel ways of profiting from trading. However, to be a successful trader it is important to test any new strategy and not blindly use them. Always test a new strategy by seeing how it would have worked if it was applied in the past. This will give a fair idea as to the validity of the strategy. 5. The habit of staying informed all the time: Any small news in the market can become an opportunity. But it is important to seize upon such opportunities before others and make a profit. To make sure you stay ahead of others, it is very important to keep a track of all the happenings in the market and have a knack for analyzing very quickly how each event can affect the market. Successful traders can spot such opportunities before anyone and profit from them before others even spot them. 6. The habit of doing proper homework: Trading opportunities exist for a very short period of time and to make profit you must act very quickly. However this does not mean you should blindly follow just one signal and trade. Make sure that signal is supported by other factors also. In other words before trading, make sure to check multiple factors. Obviously if one factor is positive and all else are negative, it may not make sense to do a big trade. 7. The habit of keeping a trade journal: Successful traders keep a journal of their trades and periodically review it as a way of refining their approach towards profiting from the volatility. There is a tremendous amount of valuable Information In the trades where you have lost. Sometimes you can find easily identifiable patterns in your losing trades which you can eliminate while planning future trades. When reviewing their trade journals, successful traders don't think of them as profits and losses but simply results. Just because you have made a loss, doesn't mean you are a loser; and just because you have a winning trade. It doesn't make you a winner. Keep good notes on each trade and review your notes often; it will help you trade better. 8. The habit of keeping the big picture in mind: Successful traders are comfortable with risk. They know they can't wait for certainty surely of the trade being profitable, before they even make the trade. They trade in anticipation of a pattern or an event. You cannot wait to get all the facts before doing a trade. Most of the times, a trading opportunity will be gone by the time all the facts about it are known. This makes trading quite risky. So losses are a part of the game. Traders are comfortable with losses sometimes but they don’t forget the bigger picture if profits outrun losses then such short term losses won’t matter. So they get comfortable with risk and learn how to manage it. 9. The habit of staying emotionally neutral (no stress): Successful traders don't get too much of a high when they have a winning day and they don't feel too low when they have a losing day. Taking a loss is as much a part of trading as making a gain is. Don't get scared when the market drops, or pop the champagne when it roars higher. Just trade and Save your emotions for the things that really matter in life like family and friends. Not stocks and trading. A successful trader is made of quick action, built around a disciplined process. It requires a lot of emotional stability. Trading is highly stressful but at the same time, it is challenging and enjoyable. However, it is important for you to remember that trading is not everyone's cup of tea. The odds of winning in trading are against the trader. The odds of winning in long-term investing are in favour of the investor. So, ordinary investors must make sure they devote the time, effort and adequate capital or follow expert research advice to be successful.